Using a food processor or molcajete, process or mash the garlic, oregano, olive oil, lime juice, salt and pepper until coarse and well mixed, yet not completely pureed. 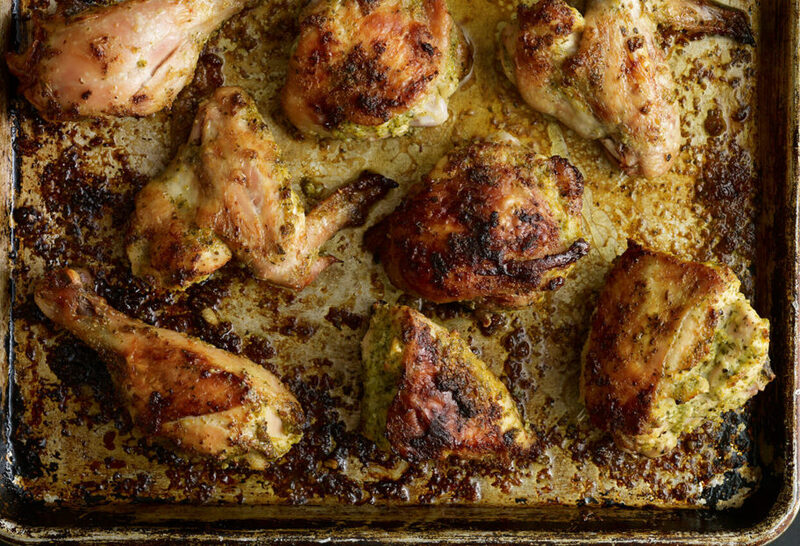 Rub the garlic mixture all over chicken and place skin side down on a non-stick baking sheet. If you don’t cook right away, you may marinate the chicken up to 24 hours, covered in the refrigerator. Place in the oven and bake for 15 minutes. Remove from the oven and reduce temperature to 375 degrees. Flip over the chicken pieces, pour the chicken broth on the bottom of the sheet, and return to the oven for 45 minutes or until chicken is cooked through and the juices run clear when pierced with a knife. Delicious and easy! I made it with the corn salad as a side. I added asparagus to the corn, it’s in season. You can marinate the chicken the night before, and when you come home from work just put it in the oven. I set aside some of the marinade and added it to the vegetables, wow! I will be making this again. I’m so happy to hear you had a yum dinner, Michell! I just made this chicken, it was fenomenal!! and i paired it the the corn salad, AMAZING. I have to agree with you Pati, they do complement each, and it was delicioso😋. Thanks again for sharing this delicious side of Mexico. Thank you for giving the recipes a try, Ivonne! I’m so happy you enjoyed them. My husband and I love your show, and your delectable recipes. What do you recommend as a side dish for the Oaxacan Chicken with Oregano and Garlic? This goes great: https://patijinich.com/grilled-corn-salad/ or this https://patijinich.com/jalapeno-garlic-crispy-potatoes/ or really anything! Made this recipe tonight and it was AMAZING. So much flavor and our home smells fantastic. Will make again for sure! Oh isn’t the smell amazing…so glad you loved it, Kreigh. Pati. LOVE your show! I’m interested in knowing which food processor is used on the show and is this one that you would recommend for home use? Thank you Julie! I use a Cuisinart food processor. Can I use jarred, minced garlic? I’m lazy. I just have to repost after making this tonight that this is a dish that will be made in our house once a week! Absolutely tender meat with a crunchy skin. Well done recipe, and my whole family thanks you!!!! I’m so happy to hear this will be a weekly occurrence, Tim! My wife and I are making 2 pans of this tonight! Can’t wait! So glad you found the recipe, Lona. If someone hasn’t asked already , how do you recommend doing this recipe skinless ? I love this skin but I need to cut back for health reasons *sad face haha would it work better in a skillet if I do skinless but it won’t char ? thank you ! You can just follow the recipe as is even with skinless chicken, Seanae. Enjoy! Where can I see your videos? Can’t wait to cook this chicken dish. I love the ingredients and will let you know how it turned out. Thank you so much for sharing your amazing recepies. I hope you love it Lourdes! The food processor you used in this recipe looks interesting–adjustable, efficient–what kind is it? Hi Joan! It’s a cuisinart. It’s in the oven cooking now! Can’t wait to see how it comes out. So happy you loved every bite of it, Raghuraman! This is one of my families favorite meals! Thank you so much! Yay! Thanks for sharing, Maygan. ¡Esta receta me encanta! What do you think about grilling the chicken directly on my gas grill’s solid cooking grate without a pan underneath? I wonder about adding the chicken broth since there would be no pan. Maybe brining the chicken in chicken broth before preparing it for the grill? Or I could use a pan and use the grill like an oven. ​You can totally cook it on the grill, and skip the broth, not necessary there. ​Enjoy, Howard! So happy to see your James Beard award! Watched Pati Jinich marathan on PBS this weekend and this recipe was included. Love the background trips and seeing the original cooking in the cities! Thanks for a great food and learning show! Thank you Ginger…I’m so happy you enjoy the show. Just watched this episode, can’t wait to make this!! Bought chicken yesterday, so to marinate tonight! I’ve been reading u on the internet for awhile, now I’m watching on the Amazon channel and I have the garlic chicken in the oven. I would love to go on a trip with you to Mexico! Any thoughts on a foodie trip? No plans for a trip yet…but I’ll let you know and enjoy the chicken, Lisa! What if I use bone in? Does Cooking time/temp change? And i love your show!!! Can I substitute dry oregano for fresh? And how much of the dry oregano? Yes you can use dried instead of fresh…use a third of the amount, so 1/3 cup. Thank you so much Adele! I’m so happy to hear that you are inspired. Saw your show made the chicken outstanding. Hey Pati great episode. I had a question is mandatory to add the chicken broth to the chicken? Hola Pati, acabo de ver esta receta y mi esposo se le antojó muchísimo el pollo, mi pregunta es si lo tienes que marinar por las 24 horas o solo puedes prepararlo y hacerlo el mismo dia? También me pregunto cómo puedes comer de todo y estás tan delgada? Me encanta ver tu programa porque promueves mucho nuestro hermoso país, me haces sentir muy orgullosa de mis raíces, Gracias por eso. Mil gracias Maria! Puedes hacerlo el mismo día o marinarlo por las 24 horas en el refrigerador. Great episode! Do you think you can make the Chicken on a charcoal grill? Thank you for always watching! Do I pull the leaves off for the oregano or some sticks acceptable? Prepared with the Ensalada de Elote Asado as per the episode. My first Pati recipe. What a hit! Thank you for sharing. I am now a fan! The Asian markets sell a lot of peeled cloves for very cheap ! I always get my garlic from Asian markets because they already have it peeled in package in a little box , I want to say 50 or 60 cloves for $1 + change . If you have an Asian market near by check it out and see if you find some . This is company chicken ! Excellent !! I am an Oklahoma wine maker. And this dish goes exceptionally well with Riesling/Gerwurztraminer blend. Oh thank you for sharing the wine pairing! That is so great! Hi Pati, we’ve just seen your show on @create for the first time and loved it! This recipe is one of the best, if not THE best recipes for chicken I’ve made. It’s simple (until my food processor quit), full of flavor and I can’t believe the result looked so much like the picture! Mom loved it also. She had me add a few more dashes of lime juice – we love citrus. Thighs were used for this first try but I have a package of drumsticks waiting for their chance! They will not be waiting too long. I recommended it to my sister who lives in San Antonio, TX, and she can’t wait to try it. Dishes like this make me want to change up my Christmas menu just a bit – maybe the garlic oregano sauce on the turkey? And the broth doesn’t seem to be absorbing like your picture shows. I can’t wait to try this meal!! Hola Pati, my wife and I love your show, I’m addicted to the coco-fish. I’m excited to try this recipe with codorniz but nervous about the baking time, any suggestions? Thanks for all your ideas! It should be the same amount of cooking time and technique. I can’t wait to try this. I have from that area. He is a horse jockey and opened a traditional Mexican restaurant as well here in Saratoga Springs NY. Thank YOU for trying it, Teresa! I watched you make this on your show and decided to make it because it looked SO delicious. It was easy to make and was indeed delicious. I made mine with all chicken thighs though. I did marinade mine for the 24-hour time frame. I wish I could share my picture of the finished product. We ate every single piece. I wish I could see the picture! wow, that was wonderful, tasty, a definite keeper. every week I can’t wait to see next week treat. recommend this dish! I’m so glad it was a keeper! You make cooking fun! Your program is also inspiring. It’s great to see a cook from ‘el DF’ putting all that delicious food on display for the world to see. I see the program occasionally in the Dallas area. My weakness and most favorite all time dish is mole ‘estilo DF’ with chicken. My wife is from Michoacan and mole from that area is very red, but I prefer the dark brown and slightly sweet type. (mouth watering). I am definitely going to try the recipe. I’ll get back with a comment too. I hope you enjoy it Gilberto, and I look forward to your comments! I’m making this chicken right now for dinner. It already smells devine. My son (11) and i have been watching you all day on Create in New Orleans today. He loved seeing you and your sons in the kitchen together and as soon as he saw you make this he asked if we could go to the store and get the ingredients! He also loved watching you go everywhere and loved when y’all went for a swim in the beautiful water and now he wants to go there!! Thank you so much for this great recipe!! Thank you for watching all day!!! And please say hola to your son from me. This looks great! How do you do the variation your Father made so the chicken comes out crunchy throughout? I just saw this episode and printing out your recipe along with the corn salad and making it tonight!! Yay! I hope you have a great dinner tonight! Seen this recipe made today on PBS. Making it tonight. I just ran into this show for the first time on cable. I’m having company and I will make this chicken. Off I go to the store. I definitely will make the burnt milk ice cream which was also featured. All summer I made homemade ice cream in honor of my mother who taught me to make ice cream. It’s great to have another idea!!! I’m so happy you found the show Kathleen! It sounds like you had a delicious Summer, and I hope you enjoy the ice cream and chicken! Hi there. Can I substitute dried oregano for fresh? Will it affect the flavor in a bad way? Absolutely! You can use a third of the amount of oregano when using dried. I tried your chicken recipe tonight, and it was wonderful. Definitely will do it again soon. Can dried oregano be used? Yes…and reduce the amount to 1/3 cup of oregano. I saw Pati’s show on LPB and had to try this! I was only able to buy half the required fresh oregano, and had to double the recipe to feed extra people with about 18 pieces of chicken, and it was HEAVEN!!! Delicious, chicken stayed moist. I lifted skin and shoved marinade in every cranny. I had to cook about 15 min longer due to large pieces, and I overcrowded the pan. I had to use a high edged, light colored aluminum pan, so I know a darker pan would have crisped the skin up better (at least with my oven). I also let it marinade for 2 hours. I will be making this again, it was amazing.